A rite of passage for generations of backpackers, Thailand captures all that is great and good about Southeast Asia. We check into the top 10 most luxurious retreats in this sun-soaked kingdom. The setting: In the north-western area of Samui, just south of Choeng Mon. The scene: With the secluded 450-metre private beach as its backdrop, this glamorous boutique resort promises ‘intuitive luxury’ on the sugar-white sands of Hanuman Bay. The stay: Pushing the style boundaries with contemporary Asian décor in flowing open-plan spaces, each of the 52 light-filled beachfront suites and villas allures with private pools. All have high-ceilings, stone-carved bathtubs, 430-count Egyptian cotton bedding and naturally-sourced toiletries using essential oil extracts. The best bits: This on-trend spa-equipped escape offers plenty of sensory adventures; from chakra balancing to zoning out in My Space, a dedicated relaxation area with a comprehensive book and music library. SPA IV offers a special Spa Buffet where you can pack in as many beauty treatments as you wish for two-and-a-half hours - or simply stick with the usual pampering crowd-pleasers. Award-winning chefs present à la carte breakfasts and signature dishes at The Edge whilst Akaryn Pizza offers over 80 gourmet pizzas cooked in the island's only wood-fired, beachfront pizza oven. For a true red-blooded indulgence, book a table at Ochos – the steak here is legendary. More information and to book: Akaryn Samui. The setting: On Koh Yao Yai's west coast, 20-minutes by speedboat from Phuket. The scene: Surrounded by 38 acres of tropical forest, the glimmering shoreline is never far away from the teak wood pool villas at this newly-opened eco-luxury resort. The stay: Each of the 79 guestrooms and villas highlight a unique architectural style that blends heritage-old building techniques and reclaimed woods with a modern décor theme. Deluxe rooms are housed in two-storey low-rise buildings whilst pool villas are built on stilts. Both levels of accommodation have spacious wooden balconies or terraces and superb vistas. The best bits: Spa aficionados are tempted with an exotic menu of feel-good massages, body scrubs, wraps and facials treatments. Thai boxing lessons, snorkeling adventures, cookery classes, kayaking and bicycle rentals are also available – or simply chill out by the huge freeform swimming pool. There are two gourmet options; By The Sea Bar & Restaurant, which offers Thai delicacies, freshly-prepared seafood, wok preparations and refreshing coconut smoothies, and Chantara, where the house specialties include BBQ, beefsteak and seafood. For the romantically-inclined, private beach dinners can be arranged. More information and to book: Santhiya Koh Yao Yai. 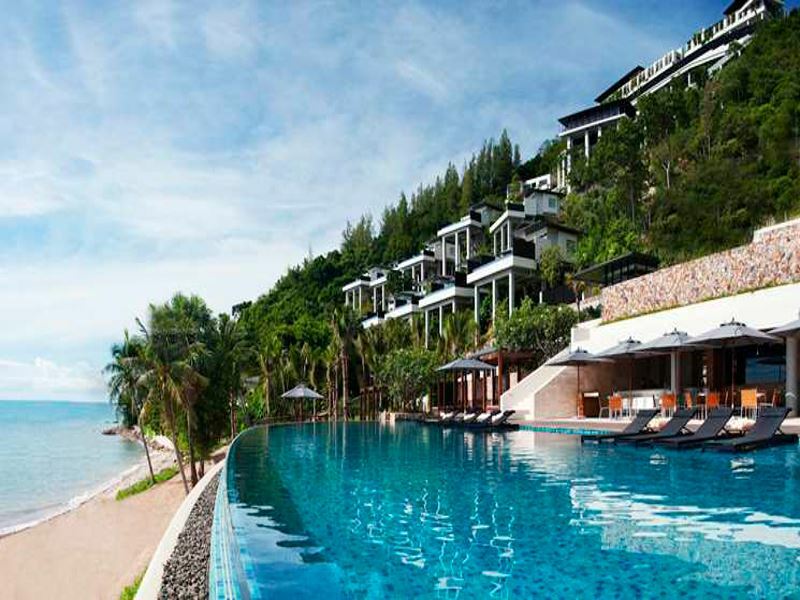 The setting: On the golden sands of Pak Nampran Bay, located south of Hua Hin. The scene: Characterised by its dazzling collection of 22 all-suite whitewashed villas set around an infinity pool, the tone at this five-star retreat is barefoot-chic with an eco-conscience. The stay: The thatched-roof bungalows, beachfront homes and swanky penthouses have open-air bathrooms, bamboo ceilings, wraparound windows, exclusively-milled Egyptian cotton bedding and private verandas furnished with hand-made hammocks. 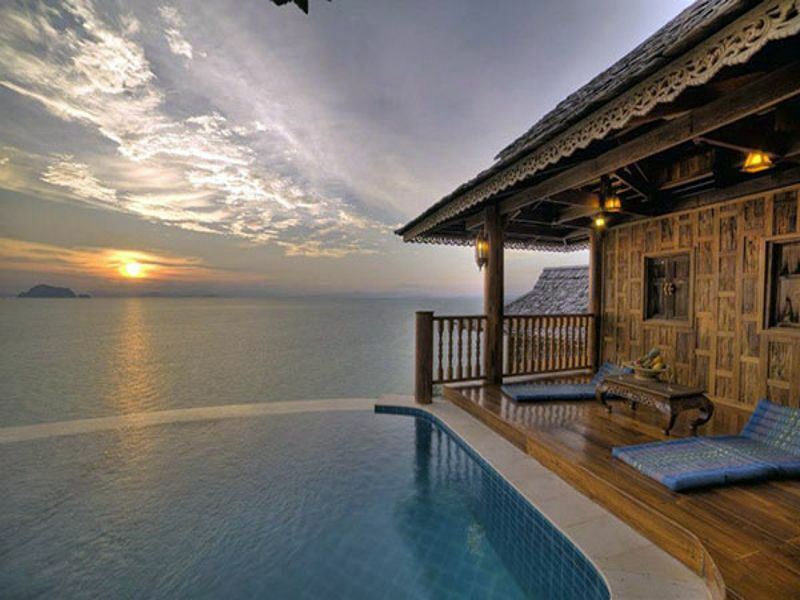 For blow-the-budget bliss, book a villa with a private plunge pool and Jacuzzi. The best bits: Whilst it lays on the luxury, Aleenta is big on simplicity. There are no televisions (guests are given pre-programd iPods with a choice of music) and all the diversions are pretty gentle; from cookery classes and Tai chi to yoga, meditation and holistic spa treatments. Cycling and kite surfing is probably as energetic as it gets. A gastronomic journey awaits at Aleenta's restaurants; The Restaurant serves delicious classic and contemporary Thai dishes whilst The Cellar presents signature dishes made with organic ingredients grown on the Aleenta’s 16-acre farm. More information and to book: Aleenta Pranburi Resort & Spa. The setting: In the heart of Bangkok, just steps from Siam Paragon shopping mall. The scene: As one of Bangkok's newest resorts, this colossal five-star circular property with landscaped tropical gardens and three saltwater pools in its center is simply mind-blowing. The stay: Opulent décor here is key; European and Asian influences contribute to the design scheme that is reflected in 303 inward-facing contemporary rooms, 42 lavish suites and 98 serviced residences. Soft-colored furnishings, wooden flooring, private balconies and 200-plus commissioned paintings and sculptures by Thai artists all add to the glamour. The best bits: There are three fine-dining restaurants: Sra Bua by Kiin which dishes up gourmet interpretations of Thai cuisine, Brasserie Europa, which hosts the signature Kempinski breakfast buffet, and the T Lounge, which offers, cocktails, champagne and a jolly decent cup of tea. The Spa is Kempinski’s first in Asia and offers an inspiring menu of signature treatments using blends of pure organic herbs. There is also a state-of-the-art gym that provides the latest cardio equipment and also runs classes in yoga, aerobics and Muay Thai. The setting: North of Koh Samui, overlooking the glistening white sands of Koh Phangan. The scene: A cluster of luxurious villas and suites blend seamlessly into the mountainous landscape at this five-star beachfront residence with an infinity pool as its centerpiece. 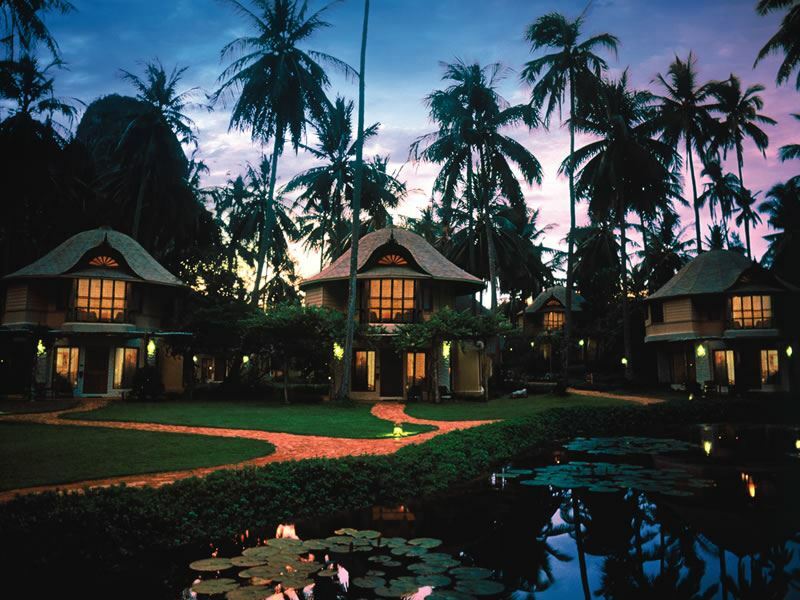 The stay: Contemporary yet distinctly Thai, each of the 64 impeccably-designed villas and suites is designed to wow. Located just steps from the sea, all have private patios and plunge pools; some have large baths and outdoor daybeds. The expected indulgences of luxury living include Egyptian cotton sheets and squishy beds with down comforters. The best bits: The Anantara Spa is a calming oasis tempting with exotically-named restorative treatments; try the 205-minute Journey of Siam which includes a floral root ritual, Thai herbal steam, white coconut scrub and Royal Thai massage. The much-lauded resort restaurants include Bistro @ the Beach where you dine al fresco under the stars on Michelin-style cuisine and The Lounge, a stylish cocktail venue with an excellent selection of wines, champagnes and cigars. For further extravagance, Dining by Design is a personalised dining concept where guests can choose their own degustation menus and matching wines. More information and to book: Anantara Rasananda Koh Phangan Villa Resort & Spa. The setting: Close to Lanta Marine National Park on the tiny island of Koh Lanta Yai. The scene: Surrounded by tropical forest, this intimate five-star boutique beach resort boasts direct access to a 900-metre stretch of unspoilt sands and crystal-clear waters. The stay: Each of the ideally-positioned 121 guestrooms, pool villas and pavilion suites is designed to maximise the use of nature elements. All are fashioned with polished teak wood flooring, bamboo blinds, rich Thai silks and dark wooden furniture. Most villas have their own pool and some have stone-walled open-air showers and sunken baths. The best bits: With a choice of two infinity pools, eight restaurants and bars, a well-equipped gym and an on-site PADI dive center, this idyllic retreat delivers on every level. Pleasure pursuits include a spa, a newly-opened outdoor sports center complete with basketball, badminton and tennis courts, and a selection of non-motorized watersports (boogie boards, sailing boats, canoes and windsurf boards) – all of which are complimentary. For an extra charge, you can enjoy elephant trekking, golfing in Krabi and snorkeling around the islands of Lanta Marine National Park. More information and to book: Pimalai Resort & Spa. The setting: Overlooking the Andaman Sea, halfway down Phuket’s west coast. The scene: A mix of prestigious accommodation cascades down the hillside at this five-star palm-dotted resort on the sparkling white sands of Kamala Beach. The stay: The design dream of Hong Kong businessman Allan Zeman, who realised Phuket’s high-end market potential after building his own vacation home in Chandara, this designer-led resort features secluded pool villas and modern residence suites. All accommodation offers outdoor showers, stylish living spaces, dining areas and fully-equipped kitchens. The best bits: Dine alfresco at the Silk Restaurant to sample a Thai menu that fuses classic dishes with a contemporary twist – or else enjoy in-villa dining for a more laid-back gourmet experience. Book a massage on one of the private platforms at the spa, unwind on oversized loungers at Anantara's private beach club, work up a sweat in the gym and enjoy island hopping on the resort's private motor yachts. Fashionistas who fancy maxing out their credit cards can head to the nearby Plaza Surin, a stylish boutique-style shopping mall filled with apparel stores and art galleries. The setting: On the white sands of Kata Noi Beach, 20-minutes south of Patong Beach. The scene: Promising a paradise setting, this 48 pool-villa resort does on-trend ‘indoor-outdoor’ beachfront living fabulously. The stay: Designed with luxury in mind, each villa boasts a spacious living area, sunken lounge and private infinity-edged plunge pool facing the ocean, garden or hillside. The no-expense-spared décor is particularly elegant with sleek wooden flooring, brightly-colored accents, plush chairs and sofas, authentic Oriental touches and clear glass doors that open onto sun decks. The best bits: This resort will enthral those who fancy the idea of busying themselves with fruit-picking lessons, aqua aerobics and yoga before checking into the Serenity Spa for a slice of holistic heaven. Stay in shape at the fitness suite, swim in the infinity pool and curl up with a book in the library – or take advantage of complimentary access to nearby tennis courts and putting greens. On-site dining options include The Harbor, a high-ceilinged restaurant serving international cuisine and cooked-to-order American breakfasts, and The Cove, which appeals to wine-loving guests. After dinner, enjoy a sundowner at The Lighthouse. More information and to book: The Shore at Katathani. The setting: On the Phang Ka Peninsula at Koh Samui’s south-western tip. The scene: With the fabled Five Islands as a backdrop, this all-suite five-star boutique resort is set on a lush hillside overlooking the Gulf of Thailand and Aow Thai Beach. The stay: Each of the 80 one or two-bedroom villas is outfitted with Thai-accented décor and assures state-of-the-art luxury; from gleaming marble bathrooms with oversized bathtubs to private ocean-facing infinity pools. For blow-the-budget decadence, book the two-storey Conrad Royal Oceanview Villa complete with sleek designer-led furnishings and a circular bed. The best bits: To satisfy the most demanding guests, there are five dining options including the Jahn, a culinary showcase of contemporary Thai and Pan-Asian cuisine in a candle-lit setting, and the Azure Bar & Grill, a less formal eatery with a wine cellar boasting over 3000 vintages. The Spa is a holistic haven where aromatic essential oils are incorporated into beauty therapies in eight treatment rooms (known as VIP suites), and there is also a fully-equipped gym and a beachside yoga deck to lure stressed-out urbanites seeking inner peace. 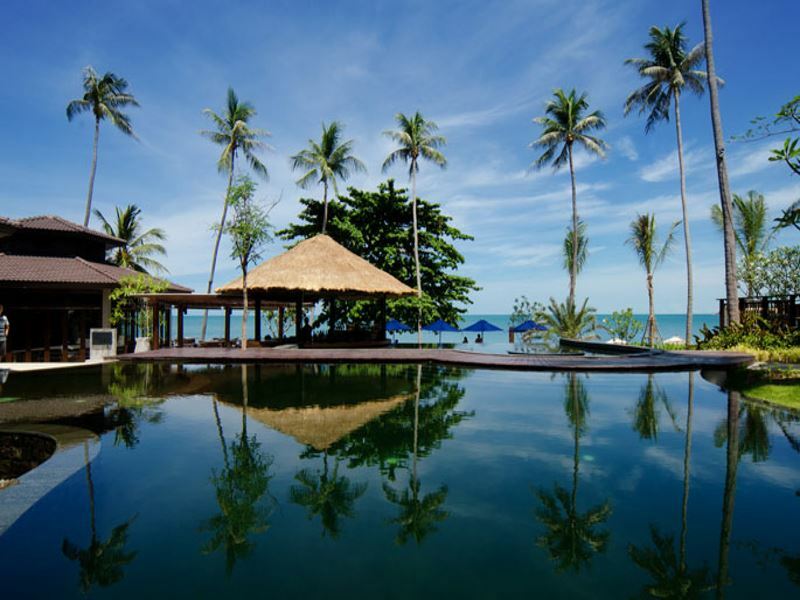 More information and to book: Conrad Koh Samui. 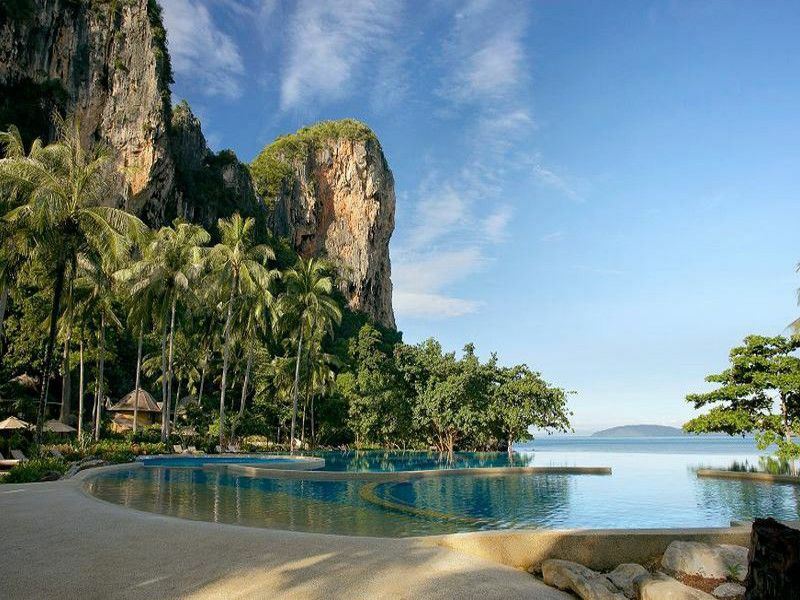 The setting: At the edge of Krabi Marine National Park, overlooking the Andaman Sea. The scene: For an all-out tropical indulgence, this stunning 100-pavillion property surrounded by three pristine white-sand beaches is accessed only by speedboat from Krabi Pier. The stay: Accommodation, which ranges from deluxe to decadent, is designed to blend into the spectacular surroundings. Each of the 98 spacious one and two-bedroom two-storey pavilions and four beachfront villas is spacious and stylishly decked out with polished wood, plush Thai fabrics, oversized bath tubs and cushioned wooden swings instead of sofas. The best bits: Upscale dining is available in four distinctive restaurants; Krua Phranang is a must for seafood fans whilst The Grotto, built into an ancient cave at the edge of Phranang Beach, is perfect for cocktail lovers. For sporty types, activities include kayaking through a mangrove forest and climbing aboard an elephant for a ramble through the Krabi landscape. But those who desire a do-nothing approach, the splendid lagoon-style infinity pool and ancient Thai therapies in the sublime spa will satisfy. More information and to book: Rayavadee.